Two years ago when Windlight was introduced, a lot of people complained that it “broke their face light” because Windlight added a lot ugly shadows to the face that could not be corrected by simply wearing a face light. If you asked me back in 2007/2008 if I would ever leave home without a face light, I would say NO! Face light was my PRIM LASHES. It was necessary! and it worked! So when Windlight “broke” everyone’s face light, some people embraced it and made nicer Windlight settings for their viewing pleasure, but lots of other people just wore even bigger and brighter lights, and in some extreme cases, full-body lights that lit up the entire sim. We’ve all seen it, and it is a complete eyesore! My friend is a CSR at a well-known skin brand in SL and one of the biggest complaints that “newbies” have is that their skin does not look *exactly* like the pretty picture on the wall. Well, duh. A lot of new players haven’t grasp the concept of tweaking their Windlight setting, and some are defensive when you even suggest it! They think that the product should look *exactly* like the vendor’s image, and most times I would agree, but we all know that how you see a skin is dependent upon your hardware, graphics settings, and Windlight setting. It makes a HUGE difference. I’m re-writing about Windlight because I received an email a couple of days ago, and a reader said that the skins she purchases (from seeing them on my site) does not look the same on her avatar. 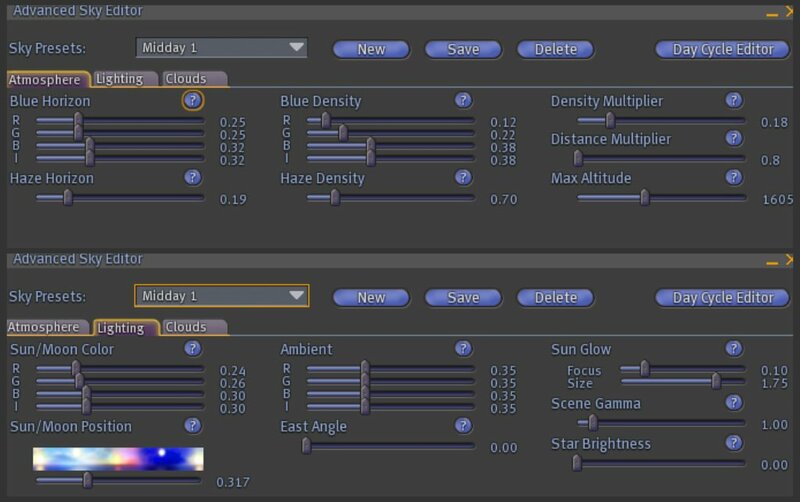 It makes me wonder if she’s viewing the skins on Midday setting, so I thought I would mention how to use Windlight settings again for anybody that might find it useful. The Midday 1 setting is a default setting that can be found on everyone’s SL client. If you can’t find it, start with NOON — I think that’s the same thing. It looks pretty ugly, doesn’t it? By tweaking a little bit, I was able to brighten the image. If you want to duplicate the result, just change your settings similar to the image above. I have only tweaked the Atmosphere and Lighting tab, and nothing else. If you wanted to play with it a bit more, you can get really cool effects in SL without ever using Photoshop. I typically don’t PS any of my images, cos it’s way too time consuming. More information about Windlight can be found at the official Second Life Wiki. You can also download tons of Windlight settings created by other residents here. Awesome! In the last few days I was looking at redoing my Windlight settings and saw your old post. Great timing! It comes with a bunch of presets from people like Ana Lutetia and Bryn Oh. There are some really excellent presets included with in package. Yeah, newbies doesn’t seem to understand that the SL client isn’t any perfect and finished product. You kind of need to finish the product yourself, in a way that satisfy you. 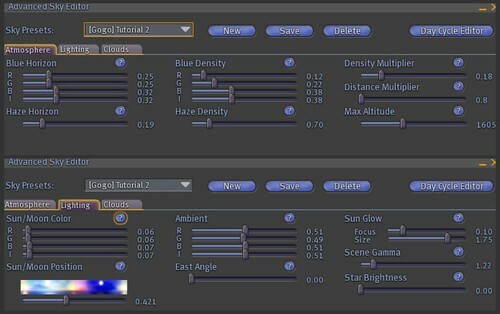 It would be great if Sl used those settings as standard as we see ourself looking nice in the settings but others not on those settings wont :(. I have to say it – if you use the Emerald viewer then you get an on screen control (in the bottom right corner) that lets you change Windlight presets and your draw distance very easily. I use the CalWL setting a lot. Nice post, thanks. The Emerald viewer has tons of Windlight settings available (more than 350) from a pop-up menu right on the main screen, including those by Torley, Ana Lutetia, Bryn Oh, etc.—very handy. Great post, Gogo. I am a landscape photographer inworld and I teach a class on Basic SL Photography which includes a broad overview of the Environment Editor. If you’re interested, or know anyone who is, please contact me. The class also covers what all the tabs on the snapshot preview screen mean, and a discussion of saving pictures to your hard drive as well as in inventory. Notecards of resources are provided, too. I use a facelight only when the windlight setting is not designed to cast shadows and only for photos. I hate walking around the grid with one on. There is a lot to learn about the client and how the lighting can effect your skin. Some skins I found look powdery in the default settings. I really wish LL would update mid day to something a bit nicer. Great tutorial btw! I came on to say this but I see that sexyback & Lizzie are saying basically the same thing: why doesn’t LL simply improve their default windlight settings so folks don’t have to do this all the time? Ok this may be a dumb question but if my windlight is awesome but my boyfriend isn’t set to my settings how does he see me? Ask him to send you a snapshot of yourself. Yes, well if LL would make SL’s windlight settings a bit more forgiving using the examples of many like yourself and they became the norm, yes this is all doable. Until then, the facelight will reign supreme. I don’t want to look good just for ME. I’d like to appear the same, are as close to possibly the same for most other people who look at me. I would surmise this is anyone’s goal with the exception of a few people who only take pics of themselves. OOPS haha NOT pointing a finger to anyone HERE!!! I do know a few who live in SL only to produce Flickr works, that is what I was referring to there! Thanks for your updated tips on the sky editor! I used these suggestions with a few tweaks when creating pictures for my new blog. 🙂 I’ve also added you to our blog list! I always mean to fiddle with Windlight, but I never do seem to get around to it. I can’t for the life of me see why LL hasn’t implemented estate-level controls. I’d really love to experience creative designers’ and builders’ preferred settings. Hello I wonder what setting you use the environment to put pictures? thanks for you help. But, how do you do that clouds? are so pretty I cant give nice clouds. Can you say the presets? I know this will seem really stupid to those who understand all of this. I don’t and because of this I have not a clue as to whether this is what I am looking for. I know many young women with low, low and lower than low self esteem issues. These young women were throw away children whose mothers had no time for them. They are now beautiful young women with hopes and dreams whose mothers still have no time for them. For several reasons these young women turn to me for the help they are looking for. I am far from being a professional although I do fool around with manipulating pictures of people, places and things. I recieve samples from Dover Samplers. I have recieved several samples of paper dolls in high fashion settings. I was fooling around one day and decided to take pictures I have of these young women and paste their faces in these settings. They loved them. These young women have asked that I do more. I do the best I am able to do with paint. I have tried other things but it seems I am never able to get the results I want so I always return to what I am used to and what is comfortable so I paint. Needless to say I am not always happy with the results so it can take hour upon hour to get the effect I am looking for. I was looking for paper dolls in high fashion design and this site came up on my search. I really don’t have any idea what my question is so I guess what I am asking is this. Is this something I can use to help me to place these young women in high fashion design, create for them an animated portfolio and take them on a tour around the world? Can I use your tools and still keep their likeness? I can only think of one place that their tour would begin and this would be France. Any information you can give to help me start these young women with their trip around the world would be worth more than the billions of dollars that are never enough. Thank You. Oh my! I love love love your blog! so pretty and so well done! 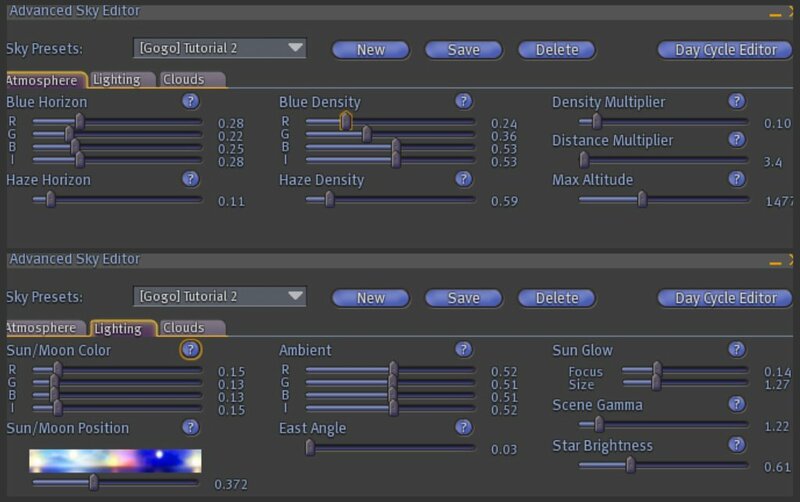 still I have a big issue with the windlighIt settings… I have the latest version of Linden Viewer 3.2.8, and it doesn’t show me, in environment editor>environment settings, all the sliders that appear in your tutorial. 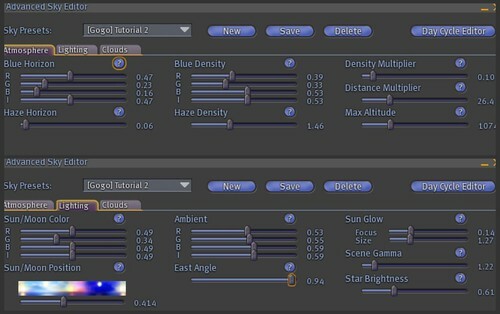 It only gives me the choice between region settings and custom settings that I have to upload from ready-made windlight settings made by others….How can I get access to these sliders windows so I can make my own settings, on this recent version? Your info for light setting was very helpful. But now I am running the new version of Second Life (3.3). Would you please help and teach me how to set the beautiful light for snapshots? I really admire your clean and bright photos effects without shadows on face and I really want to know how you do it with the new version of Second Life. Thank you if you’d like to help me with the light skill problem. This is still relevant even two years on – the facelight issue is still as prevalent now as it was when you wrote this. In fact, even more so since shadow rendering compounds the issue. I’ve just blogged about it and linked to this article – I hope that was ok! Thank you, Keira! *hugs* I’ve always admired how you have a million projects going on at once, but take the time to answer every single question, from every single person, like they were the only person that needed your time. I know this may seem like a silly question considering I’ve been in SL for so long but I can’t seem to figure out how to work the settings to get it right into Firestorm. Hiya, I seem to be having the same issue as Channelle and Sasha- how on earth do I manually adjust my windlight settings since the viewer updates?! I don’t understand why they’ve changed it it only allow presets, how exactly has that helped?! Any help or links to further info would be massivly appreciated! Hey I was trying to get my windlight settings to match yours but my windlight settings don’t have all the options you have?